I live and work in the Pacific Northwest surrounded by lots of mountains, trees and green plants of every variety. This area is commonly referred to as a “rain forest” with the emphasis being on the RAIN. We pay a price for all this beauty, especially this time of the year when it is already dark and gloomy. Instead of getting depressed by all the liquid sunshine, I created a bright and cheerful spring time quilt. There’s nothing like some bright pastels to chase away the doldrums. This sweet little quilt is easily constructed using strip piecing and fusible appliqué quilting methods. Complete step-by-step instructions with graphics, full-size template patterns and placement sheets. 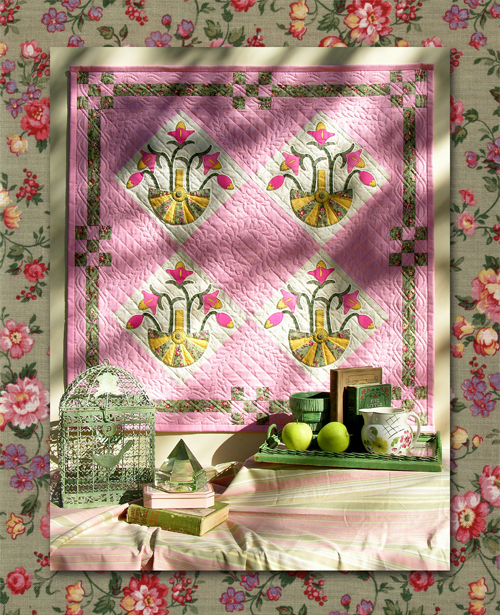 This quilt is reminiscent of the old May Day tradition of filling a paper basket with the first flowers of spring and hanging it on the door of an unsuspecting neighbor. As a child, this was right up there with hunting for Easter eggs. After knocking on the door, my friends and I would hide and wait for the surprised expressions of the lucky recipients. What a simple life! 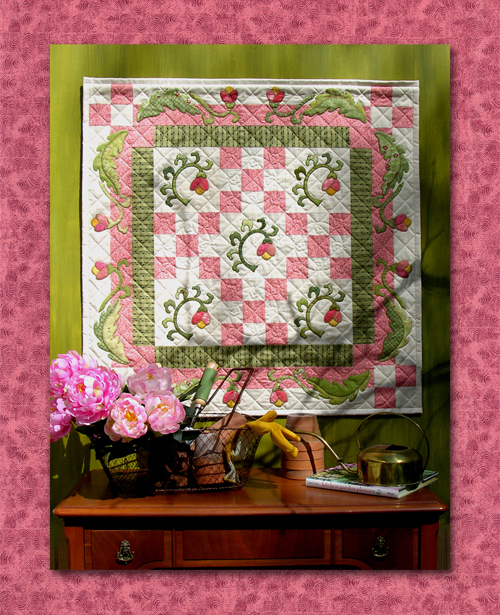 The May Basket quilt combines appliquéd floral blocks (set “on point”) and strip piecing for the border. It also uses “straight of grain” setting triangles to keep it from becoming wavy along the outer edges. This quilt is dedicated to all those wipers of little noses, testers of warm foreheads, and kissers of booboos – our mothers. They have dedicated their lives, and given up most of their sanity, all in the name of motherhood. There’s a special place for these hardworking and under appreciated women – it’s called a SPA! 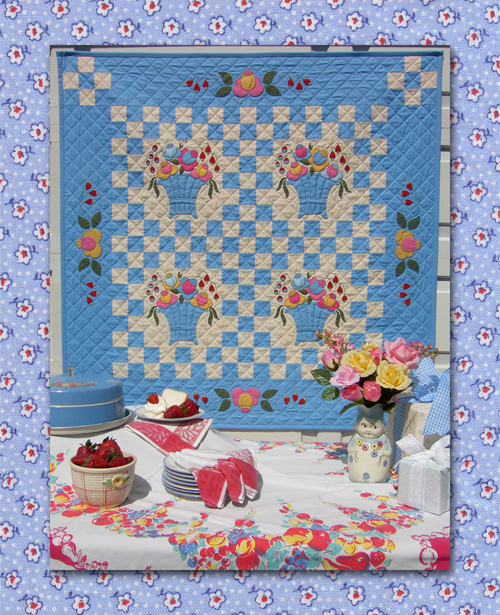 Done up in colors from the 1930’s, the Mother’s Day Bouquet quilt combines strip-pieced blocks with appliquéd floral blocks and is sure to make any mother proud. With their large seed heads and blazing yellow petals, sunflowers command attention in any garden. Not only do they nourish our bodies, they provide beauty for our eyes. They were an inspiration for Van Gogh and continue to inspire us today. 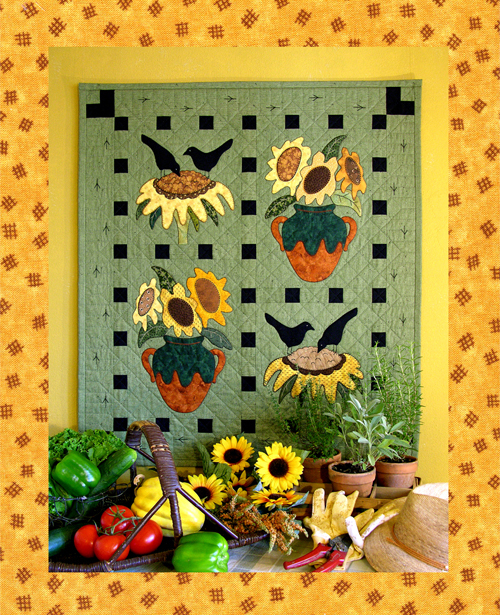 This graphic quilt captures the last rays of summer sun and will brighten any home during the dark winter months. It combines the strip-piecing and appliqué quilting methods. It would also be wonderful with a bright blue background. Years ago my daughter gave me a Christmas cactus start as part of a Girl Scout project. At her insistence I made sure it was watered regularly and well cared for but it would not bloom. Out of frustration I stopped watering it for a few weeks. Out of guilt I started watering it again and what do you know, it finally bloomed. 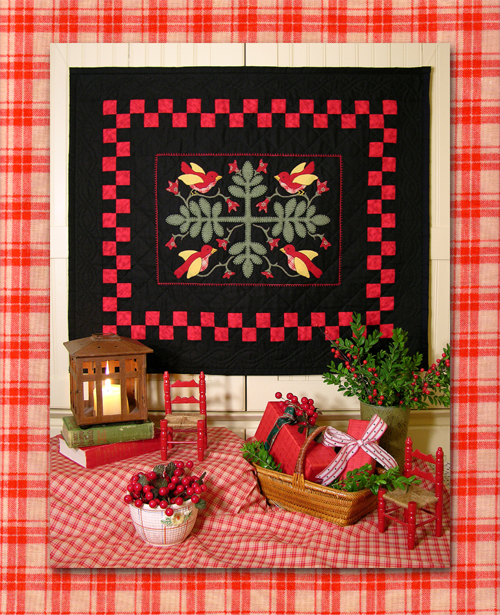 This quilt combines strip-piecing and appliqué construction and is finished with a decorative blanket stitch (and, best of all, does not require any watering). I love this time of year when the peonies start to unfurl their leaves sending their long stems topped with flower buds skyward. In the next couple of weeks those tightly wrapped buds will be bursting into big fluffy pink flowers with yellow centers and the sweet scent of summer – oh, the inspiration! This equally sweet little quilt is easily constructed using strip piecing and fusible appliqué quilting methods. 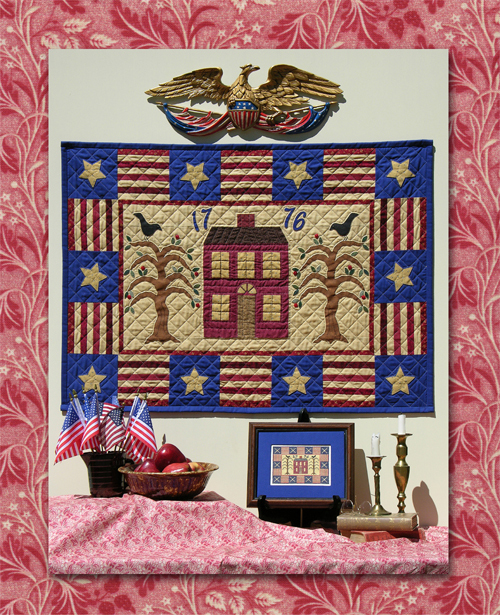 This patriotic quilt is dedicated to two of my ancestral grandfathers (seven generations back), Isaac Waggoner and John Padgett, good friends who served together in the South Carolina militia during the Revolutionary War. They, like thousands of others, helped assure the liberties we enjoy today. The stars are embroidered on a faded blue fabric and combined with a reproduction blue print, tea-dyed muslin, and tea-dyed red stripes. 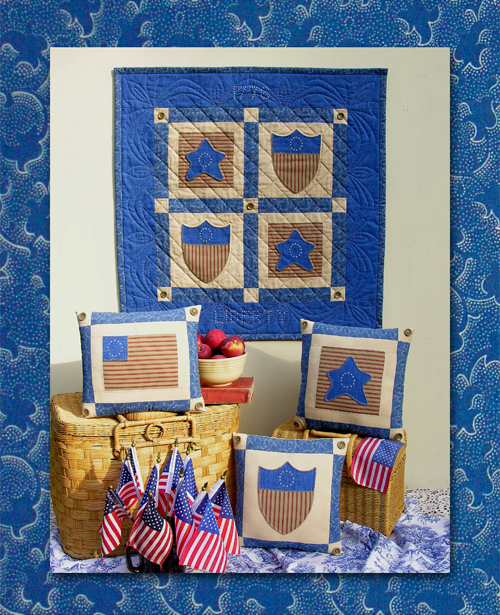 The crests, large stars and blue corners of the flag, are decorated with blanket stitches to give the quilt the look of age. By the way, after the war Isaac’s son, John, married John Padgett’s daughter, Emsey, and the rest is, as they say, HISTORY. Flag Pillow: 9-3/4" x 11-1/2"
Star Pillow: 11" x 11"
Shield Pillow: 11" x 11"
This patriotic pattern is a tribute to the small band of men who, although greatly outnumbered, bravely faced the fight for freedom in Concord, Massachusetts. Their actions in 1775 sparked the fires of the Revolutionary War in 1776. The quilt uses block construction for the house, strip piecing for the striped blocks and is finished with appliqué. The cross stitch, worked on 14 count aida cloth, mirrors the quilt. A little slice of Americana pie! What a lovely concept - high tea - that nice leisurely break in the afternoon nibbling on fancy little sandwiches, eating a crumpet and sipping tea. Unfortunately, I'm not a big fan of tea; it would be better if it tasted more like coffee. What I do like about tea is the pot from which it is poured. I started collecting teapots when I was 15 (which automatically gives them "antique status") and have continued collecting through the years. Inspiration for this quilt comes from that collection. The teapots are embroidered in traditional redwork style on tea-dyed muslin and combined with a toiles-type print. It would also be lovely done in red with a red toiles fabric accent. 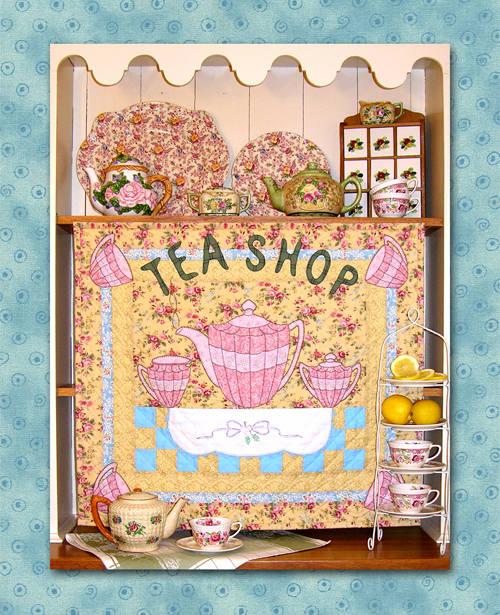 This wall quilt replicates the cheery windows of many a tea shop in merry old England. With its chintzware-like background, checkered tablecloth and steam rising from the spout of the teapot, it invites you to come in and order a spot of tea. It also gives you the opportunity to take Grandma’s embroidered dresser scarf out of the trunk and combine it with your quilting talents to create a two-generational heirloom. This quilt combines easy strip-piecing and appliqué quilting methods and has optional instructions for adding Grandma’s dresser scarf. Earl Grey that is! This Earl may not be nobility, but he makes a fine cup of tea, especially when served in an old transferware teapot which is the look I was going for with this design. 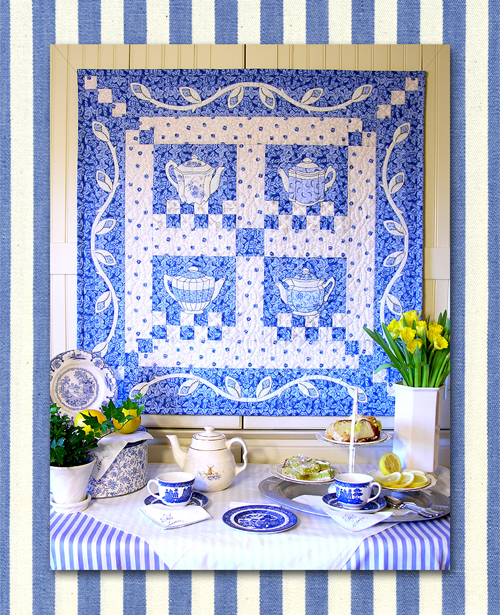 The crisp blue and white fabric add to that Staffordshire touch – it would also be lovely in other old transferware colors such as red and white or brown and white. 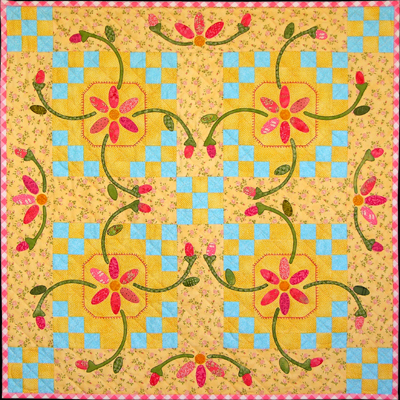 This quilt employs easy strip-piecing and appliqué quilting methods with a decorative blanket stitch on the rose buds along the border. We are excited to reintroduce our popular “Tea With the Earl” pattern using the beautiful “Cambridge Square” fabric collection designed by Ro Gregg for Northcott Silk Inc. When Northcott sent us the collection, we felt it would be perfect for this pattern and we were not disappointed. A number of years ago my good friend, Heda, gave me a few violet plants with the warning that they would take over if planted directly into the garden. I didn’t listen and now I have violets everywhere, including the lawn. I’ve pulled and dug to no avail – perhaps a good dose of “agent orange” would do the trick. Despite their invasive tendencies, they are awfully pretty. 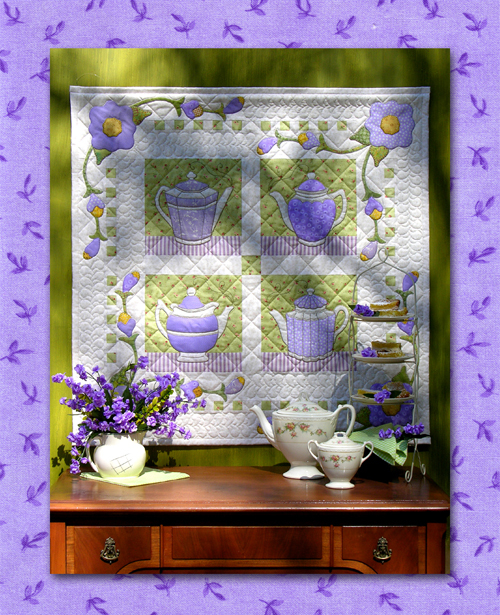 This wall quilt combines their beauty with four pots of steaming tea – a little “tea party” in the garden. 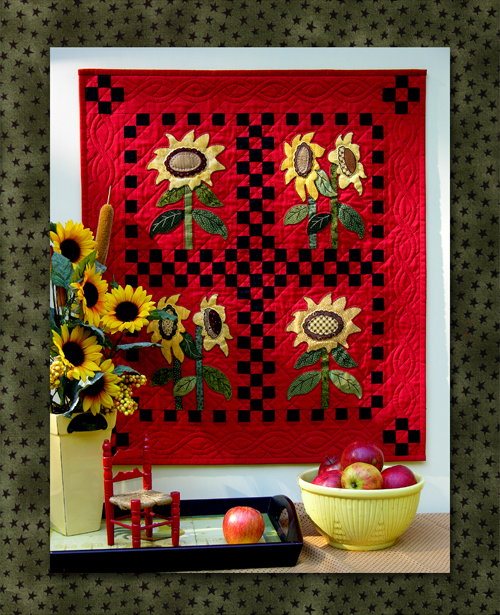 With full-size template patterns and placement sheets, this quilt is easy to construct using strip piecing and fusible appliqué quilting methods. Gardening has always been a passion; however, for the past few years I’ve been so busy sewing that the garden has become neglected. It looks a lot like the “Secret Garden” (the movie) before it was restored. In addition, a couple of years ago the crows discovered the cherry trees on the edge of the garden and they have been picking them clean ever since. 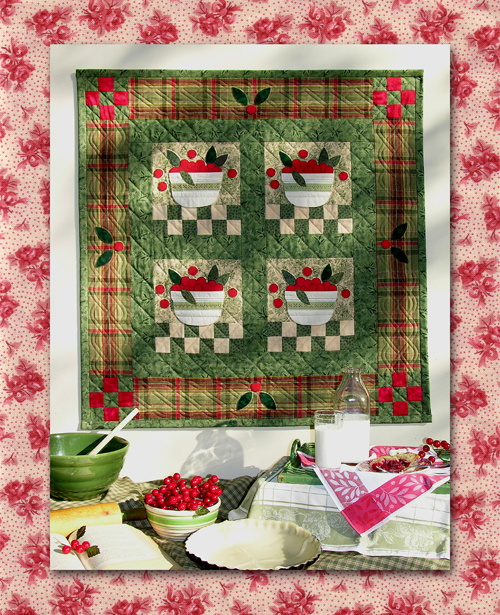 Oh well, I’d rather be quilting than baking cherry pies – have at it crows! Sunflower Pillow: 8" x 8-1/2"
Crow Pillow: 12" x 15"
Beeskeep Pillow: 8" x 8-1/2"
My mother made the best pies I've ever had; from the common, apple and blueberry, to the unusual, gooseberry and huckleberry. But, my absolute favorite was her sour cherry pie. It was a wonderful reward for a few hours of "ladder time" in the orchard. 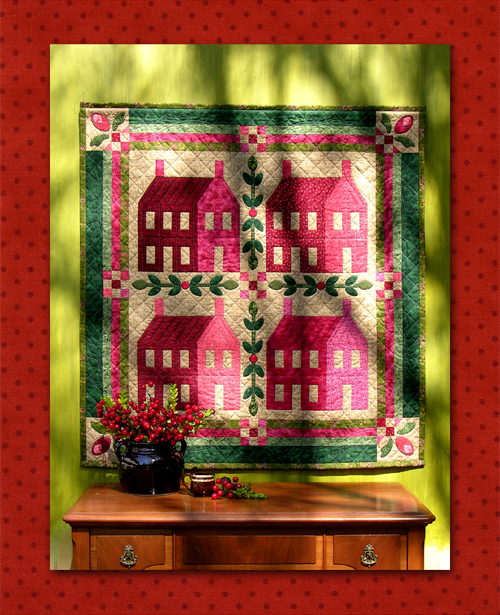 This appliquéd quilt combines my favorite shades of green with the bright red of the cherries. It would also be lovely done in shades of blue with the red cherries. The bands of the bowls are embroidered with red French knots and the cherry stems are embroidered with a stem stitch. Pumpkin season is the most wonderful time of the year. The air is crisp, the leaves are beautiful and, best of all, no more "quilt guilt" (quilting when you should be weeding). The first time I planted pumpkins, I followed the instructions and planted 3-4 seeds per mound. Unfortunately, I didn't read the part that says you should thin them after they start to grow. They took over the entire garden choking everything in their path, and they were mostly vines with very few pumpkins. I've learned a lot since then - I now purchase pumpkins from the farm stand down the road. 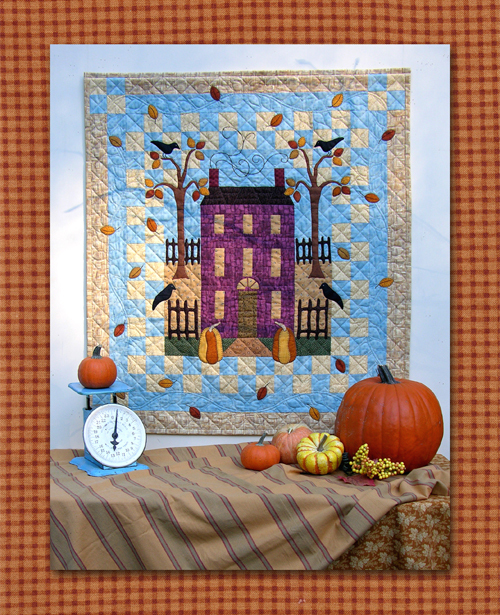 Pumpkin Hill includes patterns and instructions for two quilts. Both Quilts are appliquéd, and strip piecing is used for the inner borders & corner blocks. They are sure to add a touch of fall to your home. Welcome Quilt: 29" x 26"
Pumpkin Quilt: 27" x 18-1/2"
Keeping “uninvited guests” out of the garden is such a futile task. 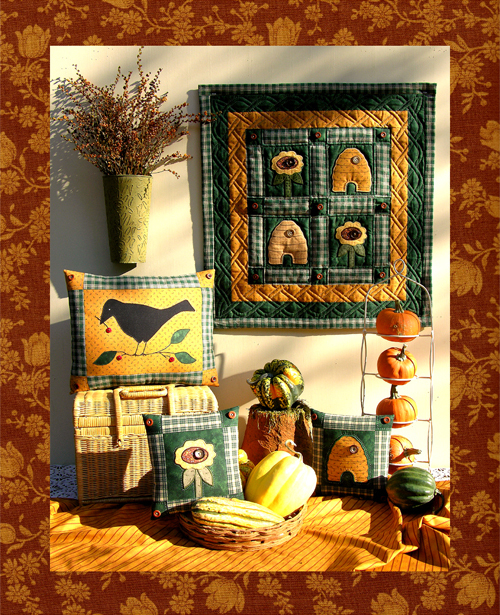 Scarecrows merely provide the birds with a great place to perch while making their dining selections. The only solution I’ve found is to sow a few extra seeds and hope the birds will “share the bounty” with me. Strip piecing, full-size numbered appliqué patterns, and full-size placement sheets make this an easy quilt to construct. Finishing details include blanket stitching on the flowers and satin stitched bird tracks on the border. 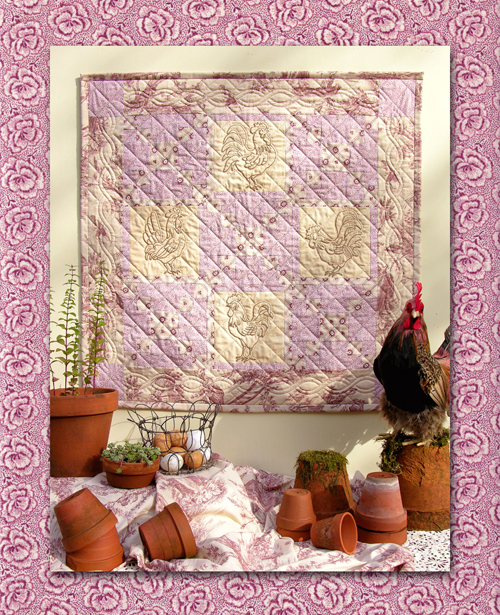 This low-contrast quilt was influenced by my love of French toiles fabric and my feeble attempts at raising poultry. As to the latter, other than their beauty and the wonderful “crowing” at 4 a.m., roosters are generally worthless. They do, however, make nice subject matter for pictures. These roosters are embroidered on tea-stained muslin and combined with French-style fabrics for a quiet and antique-looking wall quilt. I have visited Lancaster County several times over the years but never for more than a day or so. Last fall I had the good fortune of spending an entire week in this inspiring county. With visiting every quilt shop (there is no such thing as too much fabric), listening to the clip-clop of the horses pulling their buggies, and enjoying the friendly folks who are so lucky to live there, nirvana was attained. A tour through the city of Lancaster, with its brick colonial row houses, was the perfect end to the perfect week and my inspiration for this quilt. 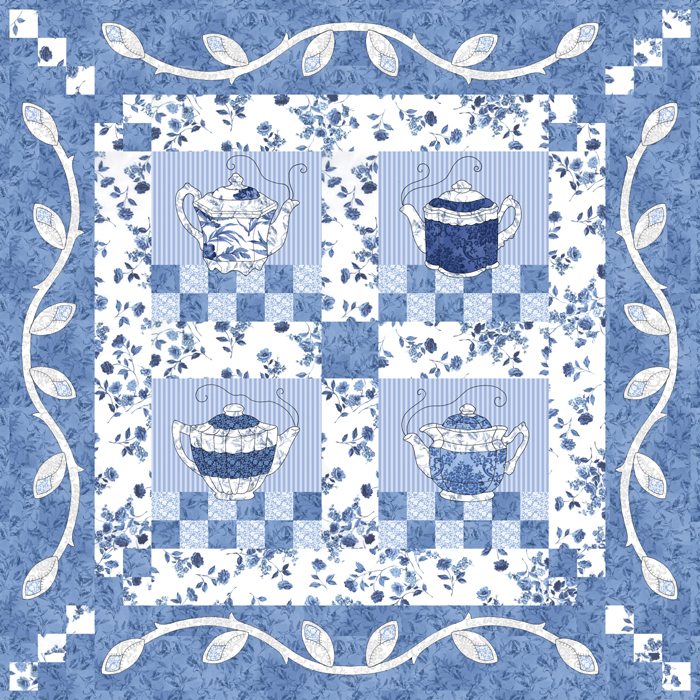 It has full-size template patterns and placement sheets and is easily constructed using strip piecing and fusible appliqué quilting methods. Last year I had the wonderful opportunity to spend several months in western Pennsylvania where inspiration is around every bend of an old country road. As I wandered from one “burg” to the next in search of another antique shop, I couldn’t help but notice the old farm houses dotting the countryside. 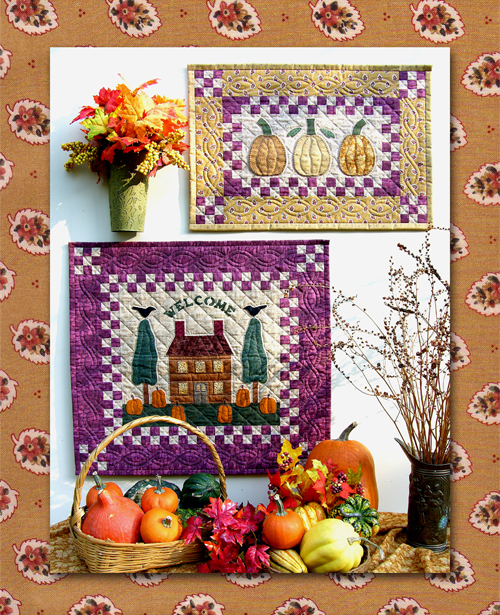 With newly-mown lawns being covered with falling leaves and pumpkins for sale by the roadside, I was inspired to create this quilt. It has full-size template patterns and placement sheets and is easily constructed using strip piecing and fusible appliqué quilting methods. 34 - 1/2" x 38 - 1/2"
While perusing my favorite antique shop I ran across thirty butterflies cut from some great old 1920’s -1940’s fabrics. The scant seam allowance had already been pressed under and basted by a quilter from the past - what a treasure! 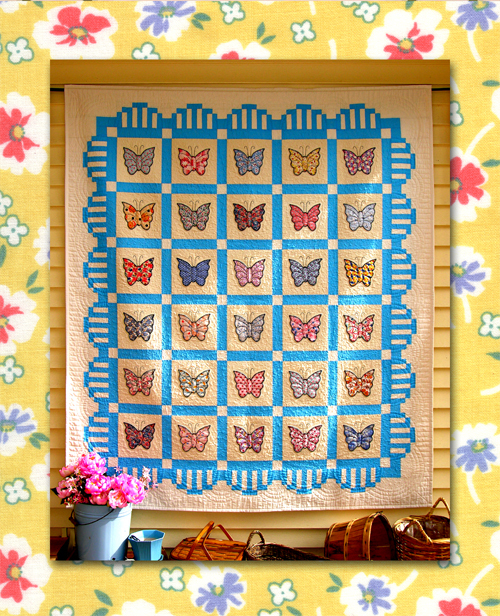 I combined these beauties from the past with an interesting border to create this butterfly quilt. 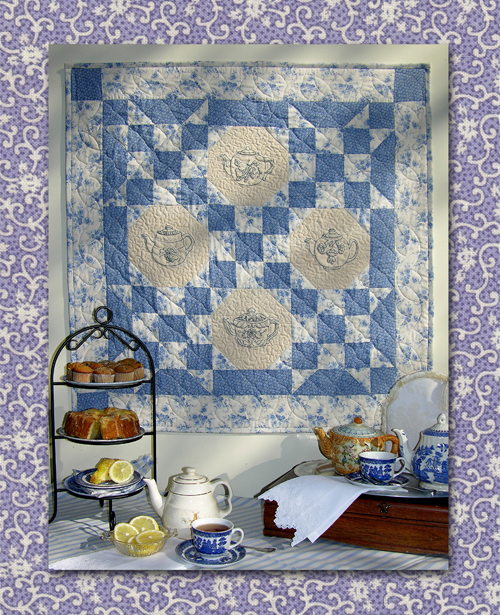 An easy strip-piecing method is used for the border to create a “scalloped” look. The butterflies are appliquéd and finished with a blanket stitch. To that quilter from the past: your quilt is complete.